It’s easy to get sucked in by alarmist headlines about shrinking investor confidence. But hear this: last year, more than 400 VC’s poured over $11 billion into 323 marketing tech startups. For martech, it was a record year. There’s no question that software startup funding is booming, and 2016 is off to a similarly torrid start. The unprecedented growth has been experienced across all factors: deal sizes, frequency, and valuations. Yes, VC's cooled on growth capital investments, particularly in tech at the end of last year. There were a number of reasons: fluctuating financial markets, markdowns from institutional investors, global conflict, and others. But what's clear is that investors are making a strong pivot to value revenue over growth in the later stages. That's an important distinction, and will shape the industry moving forward. So what does all that mean for you? Based on the most current Q1 research, we’ll break down what kinds of companies investors are responding to, which VCs are leading the pack, and what’s important to them when considering where to park their investment dollars, i.e. what you need to do to get their attention. 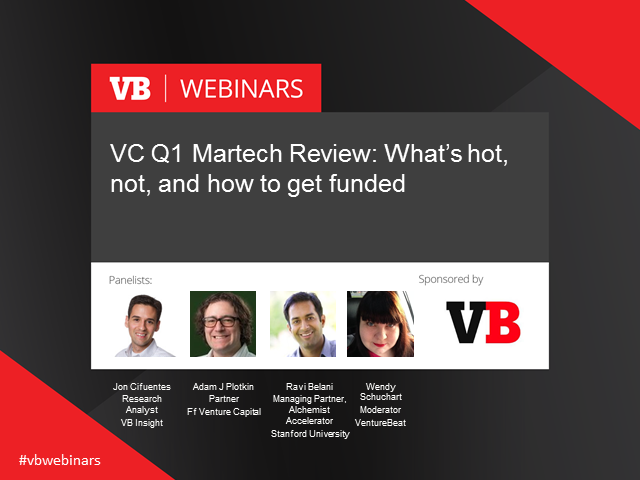 * Learn which types of companies are gaining funding, and where in the marketing tech universe they fit. * Discover where we're seeing the biggest areas of consolidation. * Find out who the most involved / most active VCs are. * Understand implications for investors, vendors, and most importantly marketing technology buyers and users. * Learn how to get noticed by top VCs, straight from investors.